Most weddings, if not all, use beautiful fresh flowers as an accessory for the big day. Whether a single stem, a posy, a bouquet or a cascade, bridal flowers are essential to complete the look every bride dreams about. A lot of thought must go into wedding day flowers as there are a plethora of decisions to be made when decorating the venues as well as for the bridal party and family members themselves. you wish to have for your wedding. You will also want to discuss foliage, and how the flowers will be constructed for you to carry them. Something often overlooked in deciding wedding day flowers are fragrance and allergies. Be aware of flowers that may set off hayfever with strong scents or a lot of pollen as a sneezing bridal party will ruin many photographs. 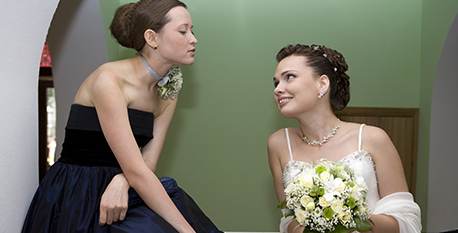 When all these elements have been decided, the bridesmaids’ arrangements can be determined. Whether they have smaller bouquets, fewer colours in the floral collection or are wrapped with a different coloured ribbon – ensure that the bridal bouquet stands out in some way. Floral hair decorations are also something to think about. Flowers can really dress up the bride and/or the bridesmaids. If the bride is not wearing a veil, flowers to adorn the hair are the perfect addition. The hairstyles will need to be decided before a decision on flowers can be made – if hair is to be worn up flowers can be tucked in and the suitable flower size chosen to suit. With short or flowing hair or a half and half hairstyle, more thought will have to go into the choice, but to ensure the perfect floral style, it is best to talk to both your hairstylist and florist. When it comes to the flowe rgirl her floral accessories are similar to the bridesmaids’. Some churches and chapels won’t allow petals to be strewn inside, so having the flowergirl carry a small bouquet or a basket of flowers down the aisle is another alternative. Young children tend to fidget and play with their hair, so a garland of flowers pinned to her head, rather than tucked into a style that may be pulled out, is also an idea worth considering. The next decision will be the boutonnieres (buttonholes). Men aren’t necessarily as appreciative of the delicate nature of flowers so pick a signature flower that will endure the entire event. You won’t want photographs spoilt with pollen staining the groom’s tuxedo or wilted petals gracing the father-of-the-bride or groomsmen’s collars. florists are experts in constructing buttonholes that will remain attractive throughout! A corsage for the mother-of-the-bride is the next decision. Ensure she knows the wedding colour scheme before she organises her outfit for the wedding day. The mother-of-the-bride’s corsage is the most versatile floral accessory. It can be a wrist corsage, be pinned to the upper bodice or be attached to a handbag. When the bridal party and family’s flowers are chosen the next step is to decide on the flowers for the venues. If it is a church or chapel wedding, the venue’s administration office may have final say on the flowers. It is best to discuss this when making the booking for the ceremony. If there are other weddings to be held at the same venue on the same day a combination of your theme colours and the other brides’ colours may be what decorates the place, so be prepared to compromise in this instance. When in a religious environment, simplicity with style is the best option. Personalise it as best you can, perhaps using natives if a favourite, or a combination of the bride and groom’s birth flowers, keeping the colour theme in mind. Proportion the size of the backdrop flowers with the size of the venue. 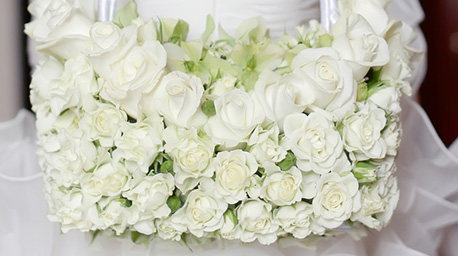 If you have it in a large church, large arrangements of flowers should adorn either side of the aisle. In most cases the flowers will find themselves in the video footage and in photographs so you will want them to suit the occasion in every way. Outdoor weddings also need flowers to dress up the event. Even though botanical gardens are filled with beautiful flowers and plants, adding your own personal touch really makes the wedding venue your creation. A canopy of flowers over the bride and groom is a spectacular sight but may not work within the budget. Flowers decorating the walkway on either side of the aisle towards the outdoor altar is an effective way to dress up a garden wedding, tall stands with vases of flowers or floor candelabras interlaced with flowers on either side of the bridal couple accentuating the wedding atmosphere. Simplicity is the key to beach weddings. With the possibility for strong breezes by the water, be careful when opting for fragile flowers. Petals decorating the sandy beach is an idea and the breezes making the petals dance around add to the atmosphere. Flowers dressing up the hair is an ideal approach for a beach wedding. Fitting in with the outdoors theme, it also disposes of the possibility of the veil whipping around the bride’s face in the wind. The wedding reception is where your flair for creativity can truly be expressed. Again budget comes into consideration, but centrepieces using flowers can easily be coordinated to accommodate all receptions. Let your imagination run away with you when creating centrepiece ideas. The colour scheme, wedding theme, floral trends and possible non-floral additions should be explored. Candles: Floating candles and flowers in a water-filled centrepiece, a floral centrepiece with tapered candles emerging from the arrangement, votive or tea-light candles in candleholders with flower petals strewn around the table, Zen style tray containing votive candles (in glass candle holders) and flowers in floral foam, the petals an umbrella over the foam. Last, but not least, is the wedding cake. It is a lovely touch to have fresh flowers decorating the cake. Coordinate the coloured icing and/or the decorative icing flowers with your colour scheme, and accent the cake with fresh flowers garnishing the base, decorating in between the layers and topping it off. Take care to ensure no toxic plants are included in this case. (To distinguish which flowers would be safe to place on the cake, refer to the edible and non-edible flowers section). Make sure you have a colour swatch or a sample of your wedding dress and bridesmaids dress material with you when visiting your florist. Clashing tomato red with ruby red could be disastrous! 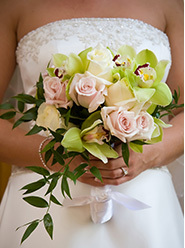 Above all we suggest that you plan your wedding day flowers well in advance with your florist. After all, you want to enjoy this special day and have the confidence that your flowers will be beautiful and long-lasting.